JACKSON – Special Agents from the Tennessee Bureau of Investigation have arrested and charged a Savannah man accused of creating hoax devices found in his home during a fire investigation. At the request of 24th District Attorney General Matthew Stowe, TBI Agents, along with authorities from Tennessee Fire Investigative Services, began investigating this case on Saturday, October 8th, shortly after the Hardin County Sheriff’s Department and Hardin County Fire Department responded to a fire at 250 Burnt Church Road in Savannah. Authorities discovered two safes in a bedroom of the home, indicating both contained explosive devices. Special Operations personnel from the Tennessee Highway Patrol responded and determined the safes did not contain explosive devices. During the course of the investigation, Agents, working alongside investigators from Hardin County, determined the resident, Joshua Steakley, was the individual responsible for the hoax. Today, TBI Agents arrested the 36-year-old and charged him with one count of Prohibited Weapons (Hoax Device). 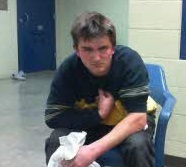 Authorities subsequently booked him into the Hardin County Jail on $100,000 bond.